This week in weird news we bring you a story from the Game of Thrones set. For several seasons now, we’ve seen Dany’s dragons grow in size and voracity, but this week, the Game of Thrones visual effects team over at Pixomondo revealed the origin story of the dragons on the HBO series. Apparently, it all started with a chicken. When the show initially began putting together the dragons, they needed a building block to start from. As there are no dragons in today’s world, they needed a creature who could give the team an idea of how muscle structure might work in the fantasy creature. Recently, supervisor Sven Martin explained to The Washington Post that a chicken worked for his team. While sophisticated software and ideas from his creative team were eventually used to flesh out the dragons we’ve seen on the small screen (and on the big screen, if you caught the Game of Thrones IMAX event), all it took for the team to get started was a trip to the grocery story. Now that we have the backstory, it's easy to look at the baby versions of Dany’s three dragons—Drogon, Viserion, and Rhaegal—and see that they have some distinctly birdlike movements and features. Who would have thought that is a chicken connection, though? Now that they have grown huge and Daenerys has had trouble dealing with the three dragons, they are much more vicious and leathery rather than birdlike and cute. We’ve seen some of the crazy and elaborate work the Game of Thrones visual team has accomplished in the past, which is why the chicken story is even more compelling—that something so sophisticated could come from such mundane origins. 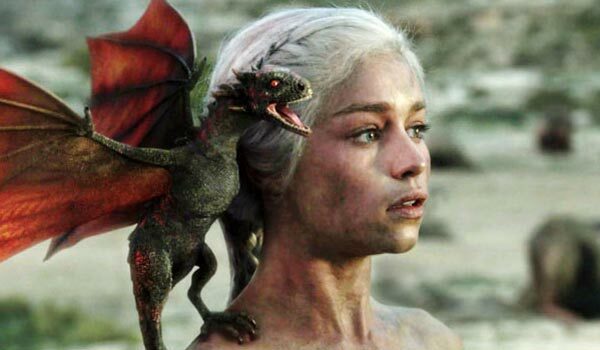 The dragons will certainly be making an appearance in Game of Thrones Season 5. The full trailer for the upcoming season showed a brief appearance from the fire breathers, along with a slew of other visual effects that will no doubt land Game of Thrones some creative Emmys. Tune in for Game of Thrones when it hits the schedule on Sunday, April 12 at 9 p.m. ET. In addition, here’s what we know about the new season of the HBO drama so far.